Total Length:———————-115cm(45.3″)/S–117cm(46.1″)/M–119cm(46.9″)/L–121cm(47.6″)/XL-123cm(48.4″)/2XL–125cm(49.2″)/3XLATTENTION: This dress is uploaded and sold by Aosh and we never authorize any other seller to sell our products. While some poor quality or size issue feedback received from the dress sold by other sellers who are selling fake dress under our listing. Please focus on the “sold by” below the size chart after choosing the size and color. If you find the sellers are not Aosh , you can find the “sold by Aosh” button on the bottom right and click on it when you submit the order. 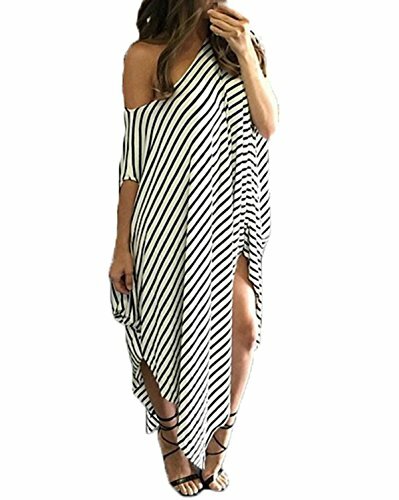 Product Description:Short Sleeve O-Neck Striped Asymmetric Loose Dress.Occasion: Suitable For Party,Cocktail,Prom Ball,Holiday Or Just Daily Wear.